One of the most frequent pieces of advice I give to students leaving school is to strive to become a meaningful part of something bigger than themselves. Every day, people all around the world use language to become involved in issues that they are passionate about and, depending on their intended audience and style of communication, may or may not have a meaningful or positive impact on the world. In this unit, we will examine the language of advocacy by reading Ishmael Baeh’s A Long Way Gone (a memoir about his time as a child soldier) as well as a number of language texts (such as op-eds). 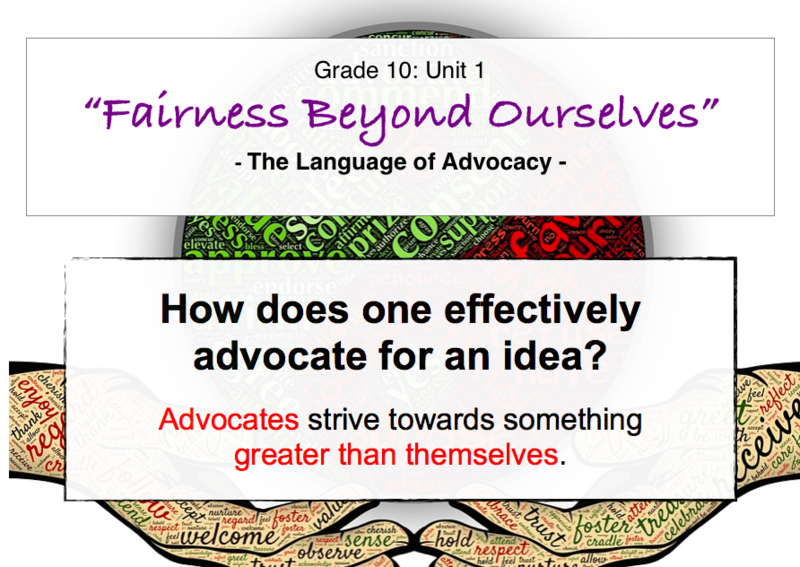 We will learn to evaluate the language of advocacy and use it ourselves. Session 1 – Hashtag Activism, or ‘Slacktivism’? We introduce the unit by examining some recent hashtags and reading opinion pieces evaluating the effectiveness of which. We will then form our own opinions and present these in an opinion essay. We will start reading Ishamel Baeh’s A Long Way Gone as writers. That is, we will read to uncover not just the story itself, but how it is being told and for what purpose. We will focus on defining features of the memoir genre. In order to start thinking more broadly about the world, and deeply about the text, we will review the Global Context of Fairness and Development and use it to explore the text in greater detail. We will learn some tools and techniques for close analysis and asking questions of literary texts in order to prepare for the upcoming ‘fishbowl’ (roundtable) discussions. In these lessons, we will learn how to hold effective discussions about literary texts. We will plan, carry out, and reflect on two discussions in order to improve our critical thinking and communication skills. In these lessons, we will examine a number of texts in which authors use language to persuade an audience to think about and take action for a cause. We will look at public service announcements, appeals, websites, and advertisements. In these lessons, we will learn about the ‘Big 5’ model of analysis and write a comparative analysis of two advocacy texts. Now it is time to speak out on an issue you are passionate about! We will finish the unit by researching a fairness and development topic of interest, researching, organising our findings, developing an argument, and communicating this persuasively using the op-ed text type. We finish the unit by reflecting on our learning. Specifically, how have our knowledge, conceptual understandings, and skills developed? As a final activity, we will read about some issues on the Amnesty International website and take action.